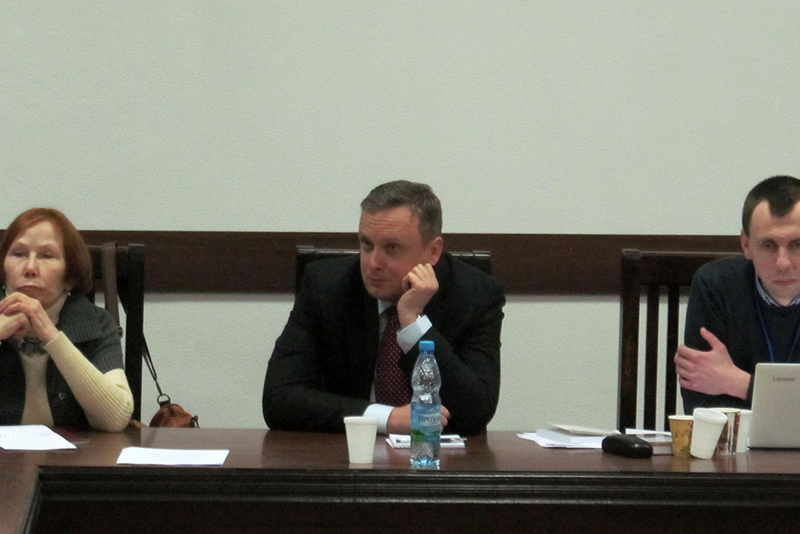 A historical seminar with the intriguing session title „Balance of Transformation: Ukrainian Historiography 25 Years since Dissolution of the USSR“ took place on the 16th of December 2016 at the Vasyl Karazin Kharkiv National University in cooperation with the Canadian Institute of Ukrainian Studies and the Ukrainian Catholic University. Contrary to other history-related discussion platforms in Kharkiv, this seminar was carried out in a round table format, involving only historians which maintained a high level of prefessionalism throughout the discussion. The seats around table were more or less equally distributed between the participants from the Western, Central and Eastern regions, which underlined the All-Ukrainian status of the seminar. But before turning to its content, one should be familiar with the events taking place just outside of the university walls first. The atmosphere within Kharkiv society at the time emanated optimism, albeit also a certain amount of nervousness. All in all, this is not surprising since the events of March 2014 still echo in the public sphere and serving as a reminder that Ukraine’s second biggest city just narrowly escaped the misfortune of Donetsk and Luhansk. Despite being situated little more than two hundred kilometers from the Donbass conflict zone in the East-South and about thirty kilometers from the Russian military bases in the North, Kharkovites’ main reason for concern was not finding themselves in a position of a frontline city. Their growing anxiety was instead caused by internal issues. First and foremost, the concerns are with disloyalty sentiments expressed by certain segments of Kharkiv society against the Ukrainian state, as well as the nationalistic memory policy of the Institute of National Memory advocated by its director Volodymyr Viatrovych. In general, Kharkovites do value his decommunisation agenda, however, they remain unreceptive to a nationalistic paradigm and instead show a growing interest in methods helping to resolve post-conflict traumas. This issue been in the agenda during a number of public discussions taking place in December 2016. To name a few, there was “The overcoming: from conflict to dialogue” convened on the 8th of December under the auspices of German official representatives in Kharkiv. The event culminated with the speech of German historian Karl Schlögel who also presented his publication „Entscheidung in Kiew: Ukrainische Lektionen“. A week later, on the 13th and 15th of December public attention turned towards Oksana Zabuzhko who arrived to Kharkiv to commemorate the 108th birthday of Yuri Shevelyov, consequently reviving the idea of the “Fifth Kharkiv”. In her closing speech she came out with a definition of the new Ukrainian identity, which is „becoming a Ukrainian by choice”, being “politically self-constructed” and to be the one who is ”highly demanded in the 21st century”, which triggered loud applause from the audience. Considering the above context in which the seminar „Balance of Transformation” took place, it would be no exaggeration to conclude that public interest in history-related topics is growing. The question is, whether Ukrainian historical science can satisfy such a demand with intellectual products adequate to the conditions after 2014. Or, borrowing the words of Volodymyr Sklokin he used in his opening speech, can historical science, as a “collective initiative”, fulfill its “responsibility” towards Ukrainian society? Having listened to the seminar historians’ words of dissatisfaction with the current state of historical science in Ukraine, the answer is clearly “no”. To name a few reasons, Ukrainian historical science still finds itself trapped in a catching-up position in relation to Western counterparts which will surely remain for some time to come. Moreover, in words of Prof. Nataliya Yakovenko, Ukrainian historiography is being captured in paradigms which, in the Western countries, became marginal decades ago. Secondly, when Ukrainian historians adapt Western patterns, they rarely support their research with their own elaborated empirical data. Thirdly, historians too often insert normative canons into their publication which downgrades scientific status of their research. Further, greater degrees of university freedoms has not contributed to the scientific development, but rather led to “feodalization” of the university environment. In addition, educational institutions produce a disproportionately high number of history graduates which caused the inflation of diploma degrees in the country. Last but not least, historical science is not institutionally consolidated enough in order to play its respective role in Ukrainian nation-building. Leaving aside critical self-reflection of Ukrainian historians, the seminar showed what is current in historical research and provided an inventory of historical science on the eve of 2017. In a chronological order, the seminar was divided into four panels with the following session titles. The first panel “Paradigms, Approaches, Methodologies” covered challenges that historical science faces in the aftermath of the current epochal shift. The second one “Institutions, Academic Environment, International Cooperation” was dedicated mainly to the problems within the institutional base of Ukrainian historical science. The manner of discussion at some point metaphorically indicated that historical science was a sport discipline, as though catching-up with Western counterparts were more important than following with the events just outside of the seminar room. During the third session “Academic Historiography in Social Context” the panelists discussed the role of historical science in society. The most memorable contributor was Prof. Yakovenko, who pointed out that the primary purpose of historical science is not to promote certain meta-narratives to the public, but rather offer it as a product designed for public use without any aspirations for a scientific “truth”. Then, panelists actively exchanged their opinions whether a professional historian ought to take the role of a public agitator in historical debates. This is indeed a topical issue, since in 2017 various political forces in Ukraine and abroad will try to distort anniversary symbols in favour of their political agenda. This mostly concerns the one hundredth anniversary of the Ukrainian National Republic (1917) and seventy years since Operation Wisła (1947). And finally, panelists on the fourth session “Religious Culture in Ukrainian Studies Yesterday and Today” presented a relatively new research project about the piousness of Ukrainian society in the pre-modern period. Panelists showed that a number of interpretation barriers which might appear when analyzing pre-modern society from a secularized point of view. The closing session left the impression that the discussed topics became even more reconceptualized than in the beginning. Overall, the seminar generated new perspectives and slightly lifted the veil of historical debates in Ukraine. In other words, new intriguing questions have been broached, and therefore continuation of the seminar in the walls of Vasyl Karazin Kharkiv National University poses itself.